That spalted beech sure is purdy. Superb job on the Scandi grind on this one. Hmmm sounds like a lot of fuss that could be solved by just drilling the holes before heat treat With a small knife it may not be really possible to get the blade entirely to desired heat without also getting the tang heated. Trying would also make me a bit worried about the difference in heat from tip to ricasso where I'd prefer that be as uniform as possible. If the tang is heated but not quenched, you still have a heat mass when you remove from the quench that could creep back into the blade and possibly temper it higher than you want. I get the benefits on larger longer blades or things like axes, but on small knives are the potential forces involved worth the potential undesirable side consequences? I would think modern steel uniformly heated, quenched, and tempered would provide sufficient toughness with least chance of something unwanted occurring. Is this incorrect thinking? Don't screw it up in the first place is great advice, but advice I personally am rarely able to abide by Once you're to the point you are with these, yeah it's kind of grind the crud out of them. Next round after doing the main forging you can do some "flattening" forging to fix up where you've over hammered some to reduce how much you have to do at the grinder. I'm jealous of those who have a proper flatter for this, but I do it with a small ball peen hammer. Using lighter more accurate blows I'm able to work down some of the high spots and bring things to a better place for grinding. If anything is way out of whack flipping the hammer over and using the ball end can help push down a mushroom etc. then go back over with the flat side to even out. This is also where I try best as I can to fix up any thickness or twist issues to again reduce grinder fixing needs. Looking good. Glad it turned out to work. I have read but not tried using a buffing compound like Zam post etch instead of going sandpaper can knock off the loose oxides with a little less worry of having the sandpaper get into the spots you don't want. That looks like a monster of a billet! Good luck, look forward to seeing it as it goes. 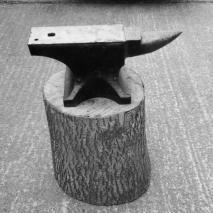 My wife bought me a new anvil back in March, but I hadn't used it yet due to lack of an appropriate stand. For some reason I just got the irresistible urge to finally use it, so I rigged up a completely inappropriate stand for it. It let me get some hammering in on it though. Just finished forging to shape a quick little neck knife out of a nub of steel off a bush hog blade. Using this vs my railroad track really makes me wish I had gotten up the gumption to figure out a stand sooner. Everything just worked better, and having a legitimate horn was world changing when it came time to shape the tang. The steel moves so much easier as well. How'd your test turn out? Interested to see just what kind of contrast it yielded in practice. Here's metal info on 8670: https://www.alphaknifesupply.com/zdata-bladesteelC-8670.htm Not one of the steels being discussed for use, but provided as an example stating the .88% nickel content is insufficient for a good shiny layer in damascus. When you look up 52100 you get no nickel and W2 has .20%, so we aren't finding a nickel champ here. The two steels are also fairly close in manganese that is also cited regularly as a factor of how a steel reacts to acid etching. Will there be a slight difference? Maybe, but I think the testing of small piece first is wise. I've seen where smiths weld the same steel to itself and get a "pattern" of the weld lines, but the damascus look where the layers themselves are different appears to require metallurgical differences, notably nickel content. If his friend wants that stark contrast, he may not be happy with a pattern that shows weld lines but can't discernibly say this is the W2 layer and this is the 52100 layer. Also, please note I never said it wouldn't work, just that the resulting pattern may not have the contrast the friend desires. Mr. Sells, do you have a reference to cite that W2 and 52100 will etch to a significant contrast such that doing a test etch first would be unnecessary? My question would come before even worrying about the heat treat. The entire point in damascus is to have the visual effect of two different etching steels. I'm not sure that even if you succeeded at everything involved that those two steels would even etch differently enough to show the pattern. I'd think it would all muddle together and look like homogeneous steel. That would beg the question, why go to that much work for something that won't look like anything. He'd be better off having you make two different knives. Or if he really wants damascus have him get some 15n20 to go with that W2. It's not a perfect method, but it works until I have things refined enough to order proper stencils. I print out the image in the size I want (can't be taller than a piece of electrical tape is wide). Then I cut the image out of the paper, not right to the image just cut a square/rectangle somewhat close around the image. Then I put a piece of electrical tape down on some scrap metal or wood. Next use scotch tape to tape the image onto the electrical tape. I cut the image out carefully with an exacto knife. Take off the scotch tape and paper, and gently peel up the electrical tape and you have a stencil you can place on the blade. I've tried both q tips and wads of old cotton t shirt as my etching pads. Seems the q tips do a better job etching and the t shirt does a better mark. Just finished this one up for my brother in law (as a surprise). Blade is forged from a John Deere mower blade, which seemed appropriate because he is a large John Deere fan. His two favorite hobbies are shooting clays and fly fishing, so I patterned the blade after a bird and trout. He builds race cars for a living, so I used red and black g10 (the fiberglass connection) for the front of the handle. His last name translates to something about birch, so the main part of the handle is stacked birch bark. The handle is backed with a piece of cherry that I've treated with hardener then sanded, treated with danish oil, then hand buffed with steel wool. No sentimental reason for the cherry, just thought it worked color wise Hopefully he likes it. My sister had let me know she thought he'd like one based on things he said about knives I've been giving others, but he didn't feel comfortable asking me to make him one. Another cheap source of wood "scales" is hardwood floor excess. If you can find an installer or a seller you can check if you can acquire their scrap pieces and shorts. That can get the classic oak, but also sometimes some of the more interesting stuff.